The restaurant management software ecosystem is complicated and getting more so each year. There are scores of technologies that abridge and solve issues that restaurants face. There is software for restaurants with a complete spectrum of operations. Then there’s the whole world of restaurant insights and data analytics. It seems that the requirements to simplify are leading to more complexity. The business analysts suggest that restaurant owners see the requirements for technology to ease the overall operations. Most of the times it is understood that effective use of these technologies needs multifaceted integrations. Also, many times even lead to interruptions to the guests. Imagine going to a restaurant to spend some calm and quality time only to be a takeover by a form or a screen. Also, having own technologies across the entire restaurant technology stack can be high-priced. Not only money but the time it takes to turn all the parts work together. This can be important when you get your significant amount of sales on a few days in a week. No one wants to be struggling with technology as a substitute for serving guests. The call for the hour is consistency, automation, and effortlessness. A higher level of competition is leading to a boost in demands from technology to trim down redundant work which is rightly so. If a smartphone can book you a flight ticket, help to navigate you to the nearby airport and manage your hotel bookings – your restaurant technology should be able to run with minimum manual interference. So what is restaurant system software and what makes it useful? It even works impeccably with your current restaurant technology systems which include your accounting and employee management tools as well as uses APIs that let you put together with any of the useful 3rd party tools. The POS is at the center of your restaurant management software system. When your client’s order gets recorded in, his information and details get stored as a part of your restaurant system database. This apart, the billing, ticketing, and other key operational activities are managed by your POS. You can now analyze your customer data with just a few clicks, see what is working for you and improve it with more insightful decisions. Also, the customer data you gather is then utilized to feed your digital marketing team with an array of automation in their promotional activities. The social media ads, SMS campaigns and automated emails follow your customer to make that repeat visit. Did you know that every 70% to 75% of your restaurant’s revenue comes in the course of a repeat customer? Your POS is vital to making this happen. It is always a good idea to be on top of what happens at your restaurant, both on online and offline channels. Like the orders, you get both by your ordering platform and online food aggregators like Zomato, Foodpanda or Swiggy. All the significant updates regarding orders and status notifications will now come into view on your dashboard, lessening your management procedures considerably. This is crucial for the Dine-in restaurant experience. You should be able to acknowledge table reservations from your site and handle all your table reservations from your restaurant management software. This lets you keep a razor-sharp eye on the guest list and the average wait times. Being updates when loyal customers are coming to the restaurant is an additional bonus. SMS and Emails keep your customers informed on the most recent updates from your restaurant. With a modernized restaurant management solution, this procedure is entirely automated after a customer offers its information. You can additionally update your databases with details on age, food likings, dishes ordered to enhance the messaging and run personalized campaigns. It enables you to reward your loyal customers with superior offers. With the effective promotion of loyalty programs, your new customers can turn to regular customers in a limited time. You can section this further into classes based on the loyalty levels being measured as well as exhibit. These levels can be estimated by their entire orders, customary order value, regularity of visits and so on. Excessive data can be paralyzing. So it’s better if your software sends you simplified but effective reports and analytics. It’s always good to spend time on insights and analytics rather than figuring out the raw data. A restaurant software system is a complete stack and highly integrated software that spans the full spectrum of restaurant technology requirements. It scales effortlessly, and you get uninterrupted enhancements to it in the shape of automated software updates. This was a brief guide on software for restaurants. 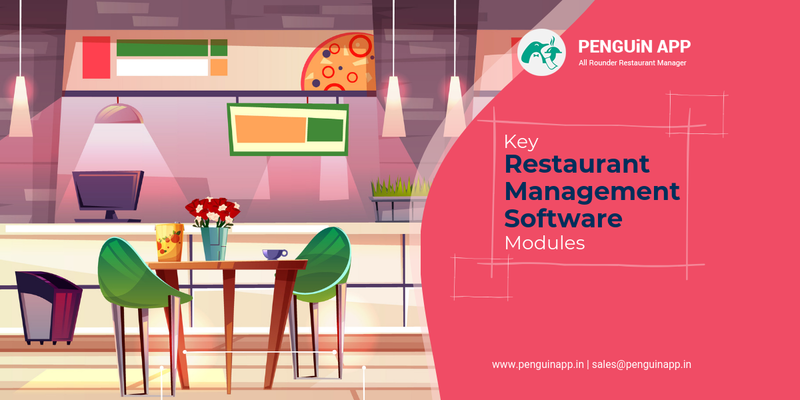 The other features that restaurant management software includes are instant billing module, inventory management, stock tracking, menu updates, a marketing module, payment integrations, analytics, reporting and much more.